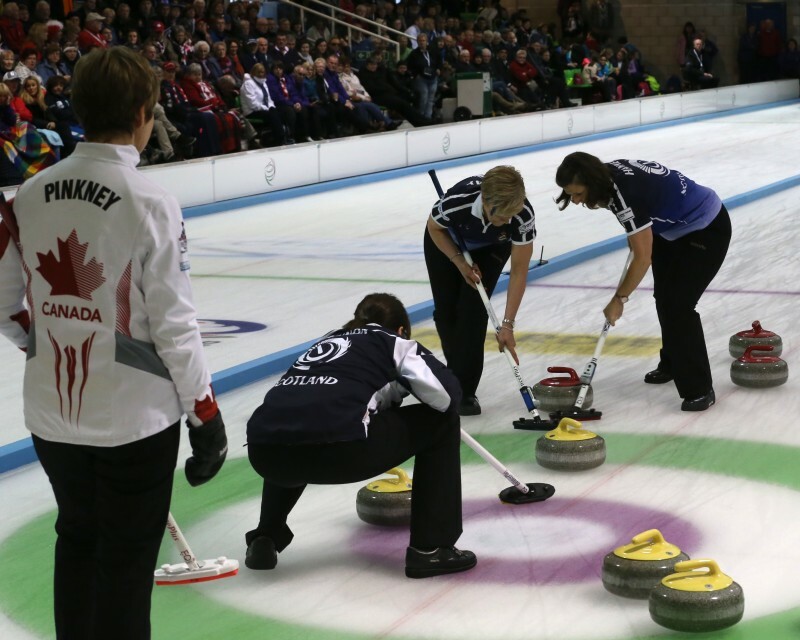 Play begins at the 14th edition of the World Senior Curling Championships in Sochi, Russia on Saturday 18 April 2015, with 13 women’s and 24 national men’s teams competing for the world titles. The Iceberg Skating Palace Training Rink, used by figure skaters to warm up during the Sochi 2014 Olympic Winter Games, will play host to the senior men’s and women’s championships. To be eligible to take part in these Championships, players "must be not less than 50 years of age by the end of the 30th day of June in the year immediately preceding the year in which the Championship is taking place". The women will play in two groups. The yellow group includes the Czech Republic, Finland, Japan, hosts Russia, defending champions Scotland, Sweden and Switzerland. The pink group is comprised of Canada, England, Italy, New Zealand, Slovakia and USA. With more teams, the men are divided into three groups. In the men’s red group: Canada, Czech Republic, Ireland, Italy, Japan, Kazakhstan, Latvia and Scotland. Their blue group includes Denmark, England, Hungary, New Zealand, Norway, Russia, Sweden and Turkey. The men’s black group is comprised of Australia, Finland, France, Germany, Poland, Slovakia, Switzerland and USA. Round-robin play starts on Saturday 18 April and continues until Thursday 23 April. After that, in the women's event, the group winners will go on to the semi-finals while the teams that finish second in each group will play the third-placed team from the other group - the winners of those games completing the semi-final line-up. In the men's event, the top two teams in each group and the best of the three third-placed teams (determined by Draw Shot Challenge performance), proceed to the quarter-finals. The remaining two third-placed teams play-off for the last available quarter-final place. In both men's and women's competitions, semi-finals will be played on the morning of Saturday 25 April with bronze and gold medal games taking place later that day. In last year's event in Dumfries, Scotland, the Canadian men beat Sweden for gold, while the women's event saw hosts Scotland win gold, beating Canada in their final. At the same time as staging the World Senior Curling Championships, Sochi will also host the World Mixed Doubles Curling Championship 2015 in the Ice Cube Curling Centre, the venue for the 2014 Olympic and Paralympic Winter Games curling competitions.